The Roussillon area, almost surrounded by the foothills of the Pyrenees, forms an amphitheatre looking out over the Mediterranean, bordered to the south by the Pyrenees themselves and fringed to the north by the rugged hill country of the Corbières. Vines have grown here in the Roussillon for more than two thousand years, the earliest traces of its cultivation reaching back to the times of Ancient Greece. Our family has worked the land here for several generations. Our estate, Domaine des Schistes, stands where the terroirs of the Agly river valley intersect on vineyards in the villages of Estagel, Tautavel and Maury. 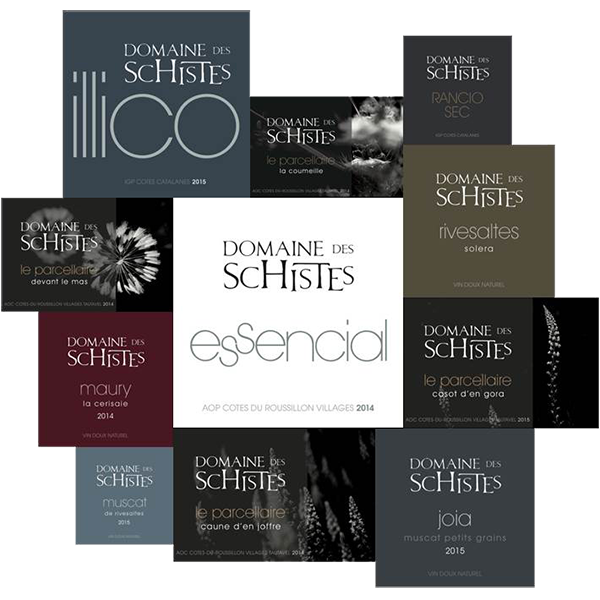 The diversity of soil, exposure and microclimate enables us to produce a range of wines, each with an affirmed character yet hallmarked by a mineral touch from the schist soils and the warmth of the Roussillon’s grape varieties. “Illico”, in the I.G.P. Côtes catalanes zone, comes from plots around the village of Estagel. The vines are mostly young and grow in deep but light soils, resulting in refreshing gulpable wines best drunk when young and crispy. “Essencial”, in A.O.P. Côtes du Roussillon White et Côtes du Roussillon Villages Red. Quite literally the “essence” or “heart” of the estate. The wines are a blend of the local varieties planted on the schistous hillsides surrounding Tautavel where the garrigue bushland abounds. Our heightened commitment to precision and clarity has led us to make cuvées based on « sélection parcellaire » or plot selection: the expression of one single venerable vineyard from one particular area, heartfelt favourites that somehow resist blending. Wines crafted for laying down, wines to match gastronomic cuisine. «Vins Doux Naturels » -sweet fortified wines- are the trademark wines of Catalonian winemaking. Full of fruit when young or unmistakeably “rancio”, with an aged complexity, they are rooted in our territory and are perhaps the roots of our future. In the 1990’s we converted a traditional Catalonian mas standing in the vineyards into countryside gîte accommodation. There are two gîtes, comfortable and well-equipped and classified with 3 wheat ears (top rank). Standing side by side, each houses four people so together can accommodate a group at the same location. It’s a quiet spot, a small hamlet with a few winegrower families at the foot of the Cathar castle of Quéribus. You can cook your seasonal cuisine with local produce bought at the nearby markets, enjoy walks through the vineyards, stroll through the streets of Perpignan or visit the surrounding highlights (Tautavel, Cucugnan, the Wine Route, the Cathar Castles…). The Mediterranean coast, with Banyuls and Collioure, are barely an hour away.